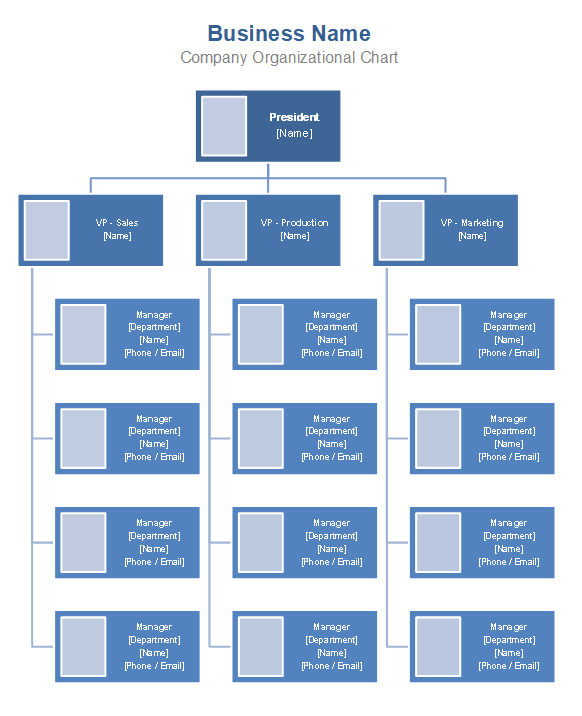 Need to create an organizational chart for your company? Have you considered using Excel instead of PowerPoint or some other organizational flow chart software? Read through to the end of this page to see why you might want to use a spreadsheet to create your company's organization chart. 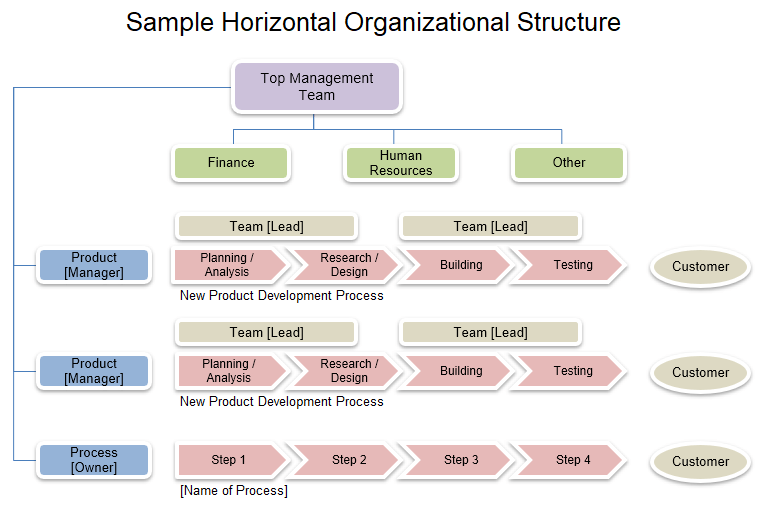 All of the org chart templates created by Vertex42 on this page can be downloaded for free. We've also listed other non-free resources. This template uses basic shape objects and lines to create an org chart. To add photos, delete the placeholder image and go to Insert > Pictures, then resize and crop the image as needed. The template contains an additional worksheet without placeholders for photos. Update and customize this template using the Excel SmartArt feature. Select the chart then go to the SmartArt Tools tab to edit the Design and Formatting. To add photos, click on the placeholder image icons and the Insert Pictures window will open up automatically, then choose the image you want to use. This template uses simple shape objects to show the organizational structure of a department consisting of a manager, assistants, team leaders, and team members. Lines are not always needed, especially if the structure is clear from the positioning of the roles within the chart. 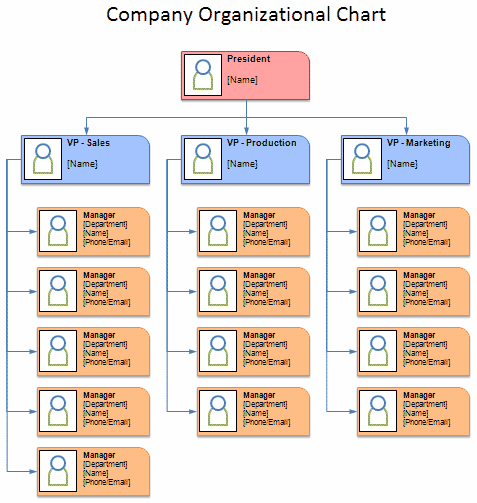 A sample organizational chart for a nonprofit organization, created using basic shape objects and connector lines in Excel. Three different sample school organizational charts on separate worksheets, created using basic shape objects and connector lines. This awesome tool provides a very easy and powerful way to create large organizational charts. First, you create a list of the names of the people in your organization and select the person they report to. Then, you can customize some of the elements of the chart, such as whether or not to include photos, and the font/border/background of the text areas. Press a button to create or update the chart. Although a bit more restrictive than drawing your own boxes and lines, it is a LOT faster! Disclaimer: I'll receive a commission if you purchase this product after clicking on the Buy button, but I'm recommending it because I like it. The image above is something I created as I was testing it. It was very easy to add the photos and I really like how easy it was to customize the text areas. - Jon Wittwer. 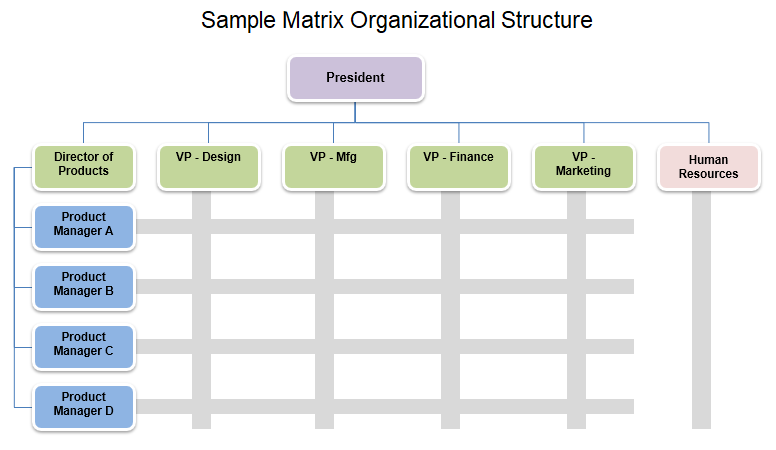 A matrix organizational structure attempts to combine both vertical and horizontal structure and results in workers reporting to more than one manager. For example, one manager might be in charge of many engineers, but those engineers may work on different projects and therefore report to their product managers as well. A functional organizational structure groups workers based on the type of work or skill (such as finance, sales, IT, customer service, research, etc. ), with each silo having its own vertical hierarchy. 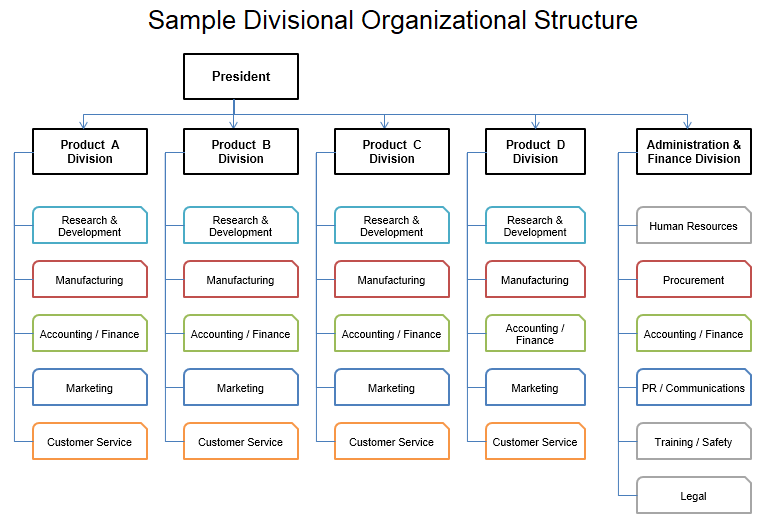 A divisional organizational structure is generally based on different geographic regions, markets, or product and service lines. This is particularly common in large corporations. This type or organizational structure has fewer levels of middle management (less vertical hierarchy). An org chart for horizontal structure might focus more on product, process, and communication rather than on chain-of-command. This example shows the product cycle as well as team leads and product managers. Why use Excel to create a Company Organization Chart? You can create a very large organizational chart and then use the print settings to fit the entire org chart onto a single page. Trying to fit a large flow chart on a single PowerPoint slide is harder because you have to play with fonts and it's harder to scroll around on the page when you have it zoomed up. It is very simple to align blocks of information either in columns or rows. Think of the spreadsheet grid as your "drawing grid". You can use drawing guides and turn on a grid in PowerPoint, but it's not as easy as using the grid in Excel. You can resize an entire row or column of blocks in your organization chart by just resizing the row or column. By default, Autoshapes in Excel move and resize with the cells. When it comes to creating flow charts and diagrams, Excel is great! Not only do you have many rectangular shapes available to you (various types of rounded and chamfered corners), but it is also extremely easy to add color, gradients, and shading to the blocks of your organization chart by just selecting formats from the gallery of themes. Go to Insert > Shapes and choose one of the rectangular shapes. Click on the rectangle you just inserted. A contextual ribbon is then displayed which will allow you to select a ready-made format. To add a connector line, go to Insert > Shapes and choose one of the Connector objects. Tip: If you click on a connector line and the end shows a red bubble - that means it is connected to the other object. Tip: To align the blocks of the org chart to the spreadsheet's grid, hold down the ALT key as you draw or resize the Shapes. The Alt key causes the Shapes to snap to the corners and edges of the grid. OrgChart by OfficeWork Software at orgchartpro.com - Developed specifically for creating org charts. 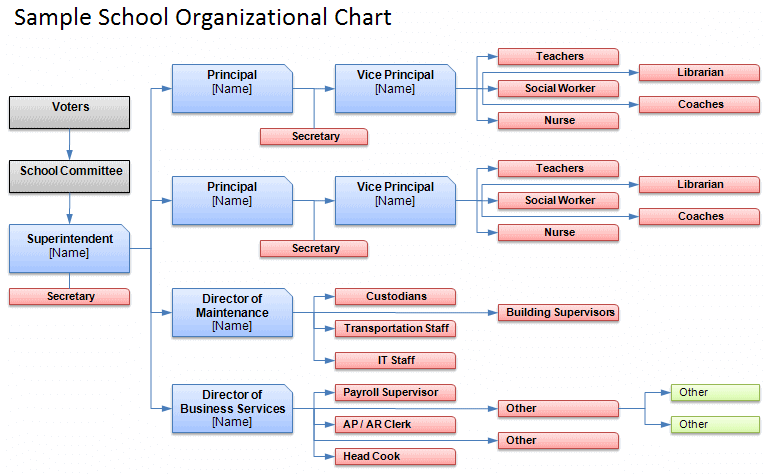 Organizational Chart Examples by EdrawSoft - edrawsoft.com - Get ideas for designing your organization chart from this gallery. 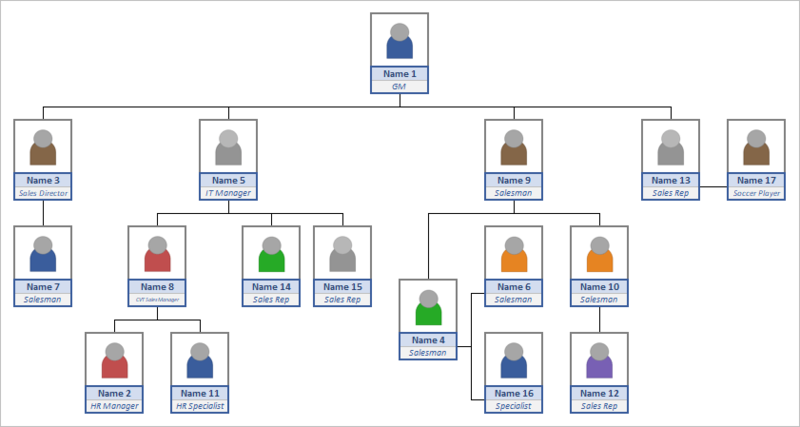 Org Charts by SmartDraw at smartdraw.com - You can see examples or download the trial software for free. 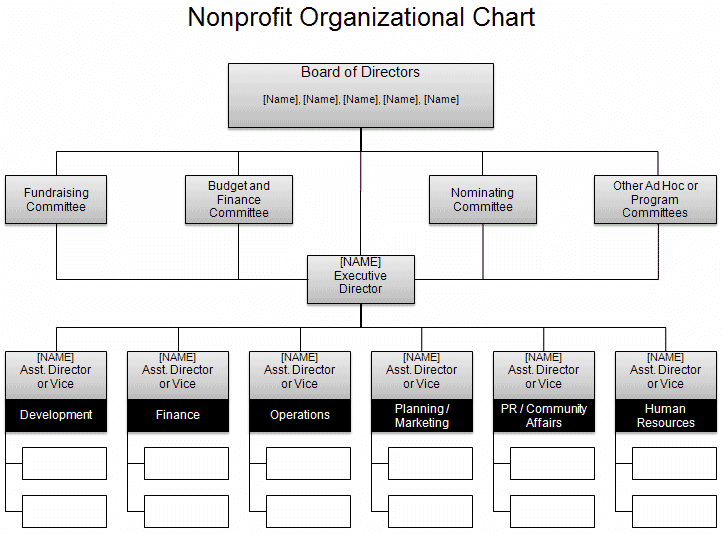 Traditional Nonprofit Organizational Structure at hurwitassociates.com - Shows an example chart for a non-profit organization. How Org Charts Lie - hbswk.hbs.edu - An interesting article that compares the theoretical organizational structure with the informal structure revealed by a social network analysis. 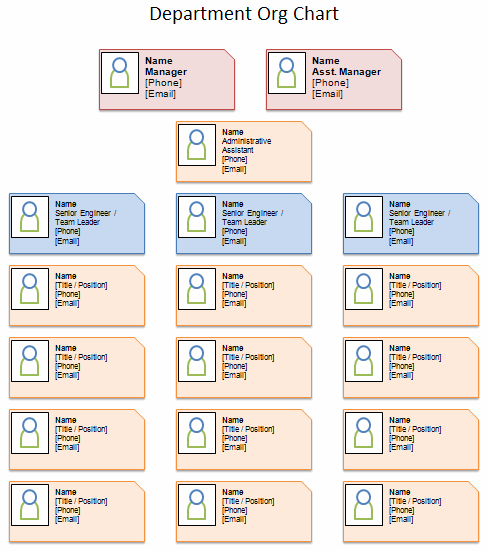 Example Org Charts at cogmap.com - See actual organizational charts for real companies like Google, Microsoft, Apple, Facebook, etc. 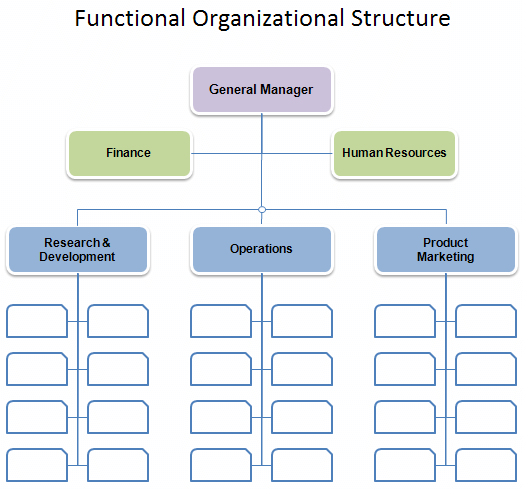 (.pdf) "Fundamentals of Organizational Structure" at unf.edu by H. Eugene (Gene) Baker III, Ph.D.
Matrix Management at wikipedia.org - See wikipedia for general definitions of various organizational structures.